Celebrate the Big Game with this slam-dunk take on nachos! Preheat the oven to 350ºF. Place the Hoffy Hot Dogs on a small baking sheet in a single layer. Arrange the tator tots on another baking sheet in a single layer. Place the hot dogs and tator tots in the preheated oven. Bake the hot dogs, turning once, for 15 minutes, then continue to bake the tator tots for 15 minutes morning, tossing often, or until golden. 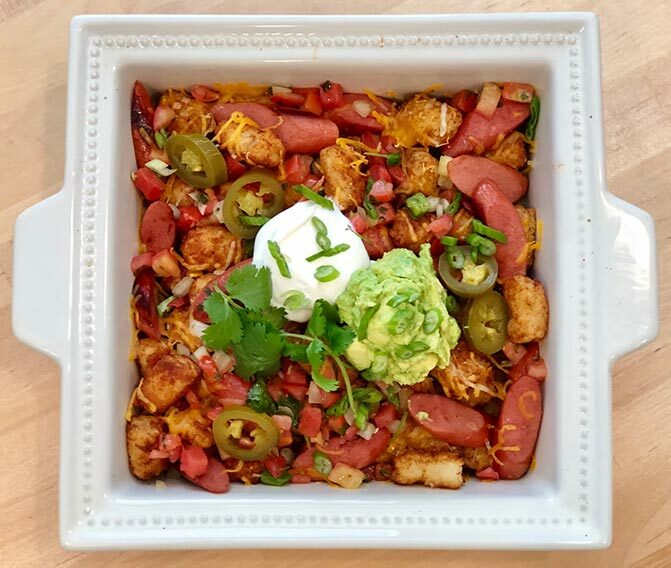 To assemble the nachos, place the tator tots in a large shallow casserole dish. Slice the hot dogs on the bias into bite-sized pieces and scatter the hot dog pieces over the tator tots. Sprinkle with the cheese and place the casserole dish back in the oven to melt the cheese. Once the cheese has melted, remove the casserole dish from the oven and garnish with Pico de Gallo, pickled jalapenos and green onions. Top with a spoonful of sour cream and guacamole and serve immediately.